I need help. I desperately need help. I have spent almost all of my crafting time over the last week working to complete my sock. (Granted with a full time job and family that's not much time but I racked up some hours over the weekend.) I was having a problem understanding the post-it note pattern my knitter friend from the local LYS gave me so I emailed her. (Yes, I was originally given the instructions step by step on post it notes throughout last year. What can I say, its a learning process.) She wrote back with the pattern thoroughly written out in a text document. I was so excited and had made so much progress in the last day or so that I didn't email to thank her. I swear this was because I was going finish that night and send her a picture of the finished sock. That did not happen. I'm a bad knitter friend. I'm sorry. So what did I do wrong? Please help knitter friends. These are the bad stitches. (The center is in focus and the rest is blurry because of the camera. Of course that excuse will get old and people will hate my blog posts since at least once a month I have a blurry picture....) I have no idea what I did wrong. This specific portion of the sock was all kinds of confusing since it was during/after turning the heel and connecting the gussett. 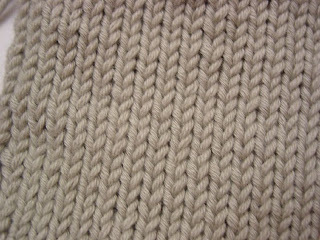 These are the good stitches that look like normal stockinette. After I got back down to 20 stitches on the bottom needles my knitting went back to normal. The top of the sock looks like this as well. It's just the in between that worries me. It looks like you twisted the stitches somehow. 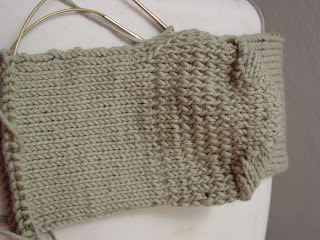 Did you do the knit stitches any differently from how you did them for the rest of the sock? 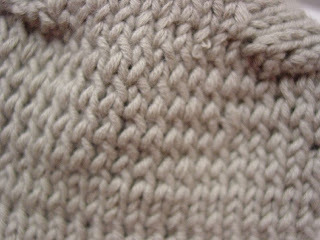 What about your purl stitches........are you comfortable with purling?